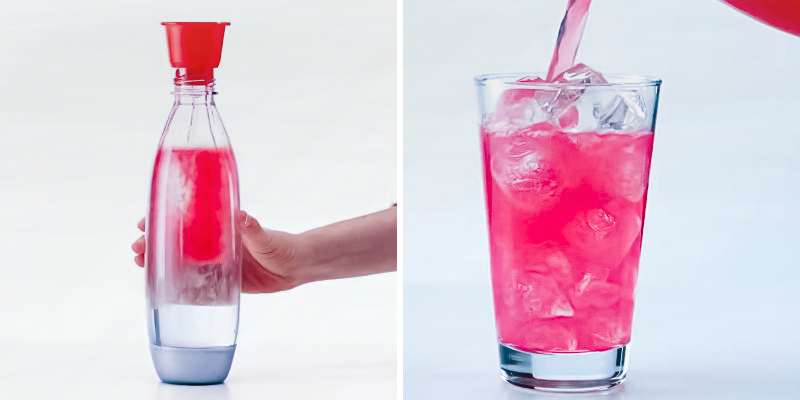 "One-Touch" Electronic Carbonation function lets you make the kind of soda that you and your family love most. The digital controls greatly simplify the process. Manual carbonation option is not available. 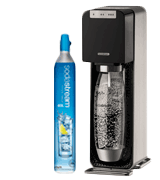 The SodaStream Power is one of the most advanced carbonation systems designed for turning ordinary tap water into sparkling soda in a matter of seconds. Easy-to-use, durable, powerful, and fully automated, this top-rated machine will allow you to make healthy carbonated drinks in a pleasant home atmosphere. The package includes a reusable carbonating bottle. Made of premium-grade BPA-free plastic, it is as safe as glass yet much more durable and impact resistant than fragile glass bottles. It might take some effort to remove the bottle from the unit. 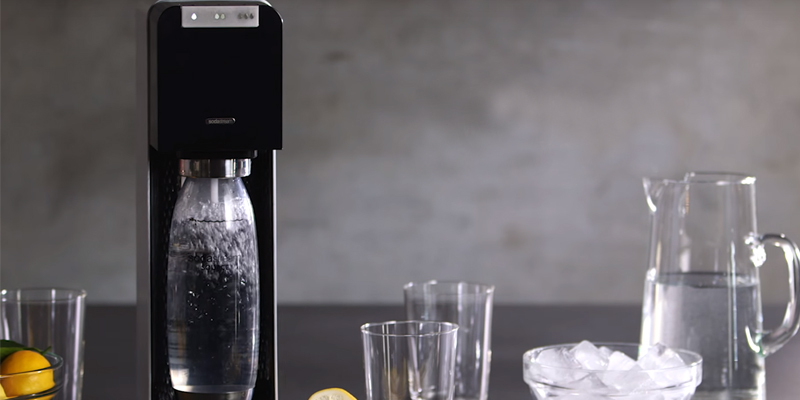 The Fizzi soda maker is one of the latest models in a SodaStream range. It offers all essential features and functionality of original machines from this leading brand in a new sophisticated design. Thanks to its compactness, the unit will fit into any concise space, be it a kitchen in a studio or summer house, a dormitory room or even RV. The syphon uses standard CO2 chargers which are sold in every store. This saves you the trouble to contact the manufacturer for replacement chargers. A single cartridge allows making only 1L of soda. 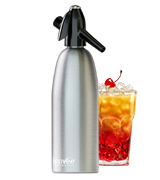 The Nuvantee soda maker offers a time-proven classic syphon design, ease of use, and high portability. 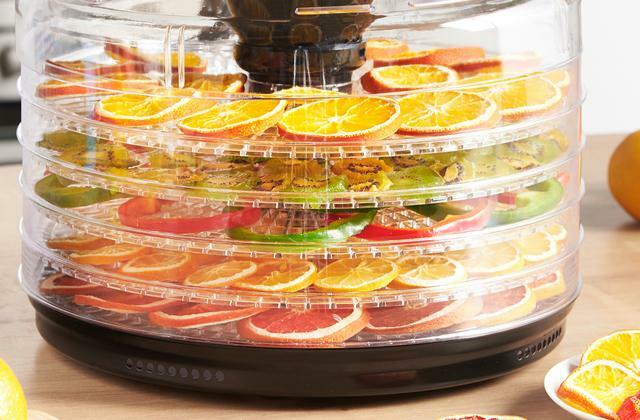 It will come in handy at home to make a pitcher of cooling citrus or watermelon lemonade on a hot day or create a whole variety of custom drinks for your pool or barbecue party. 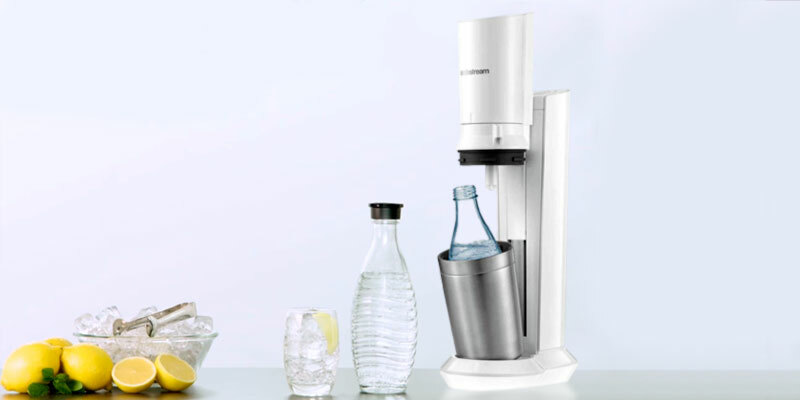 Stylish, easy-to-control, and compact, the SodaStream Crystal will find its place even in a small kitchen or bar. Owing to its space-wise size and portability, you can use this machine not only at home but also in the office or when going to picnics to be able to enjoy your favourite refreshing drinks wherever you are. A secure bayonet lock makes it easy to install a carbonating bottle quickly and hassle-free. When the drink is ready, taking the bottle out is easy by pressing one and only button. 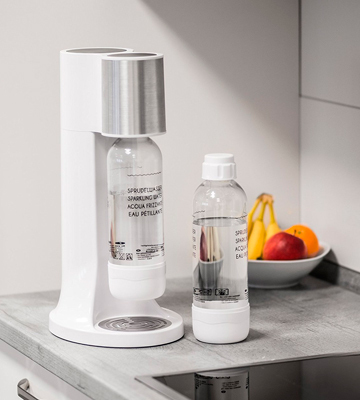 If you are an enthusiastic soda fan and want to pack your kitchen with a quality soda maker, the Levivo set is one of the best options to go for. 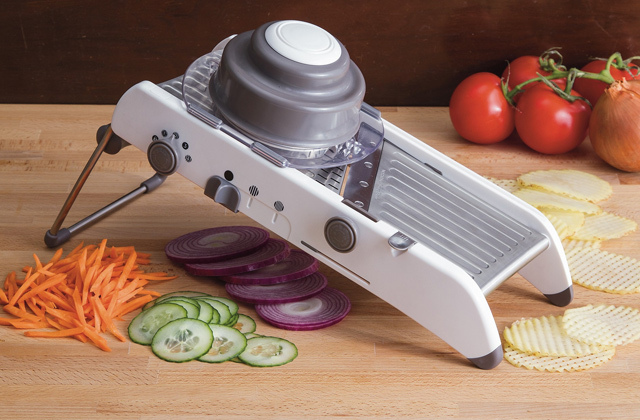 Made of durable and eco-friendly plastic with stainless steel insertions, this model will serve you for years. 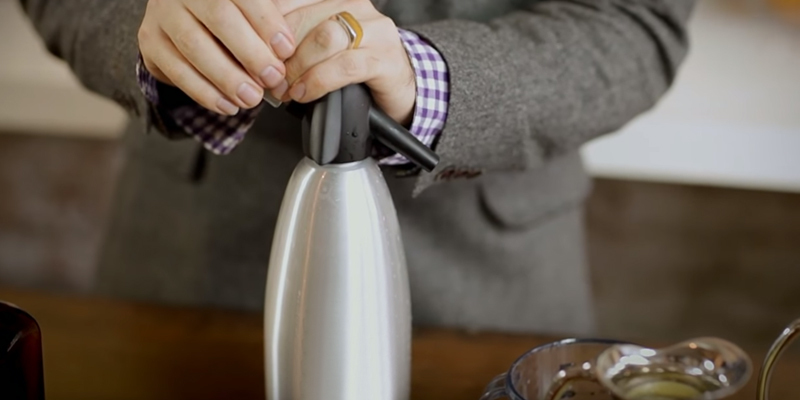 Plus, packed with 2 carbonating bottles, it will let you not only make drinks but also take them with you. Are you one of those people who usually keep a supply of cans of Pepsi, soda, lemonade in the fridge? Stop lugging heavy cans and drinking refreshers packed with calories. 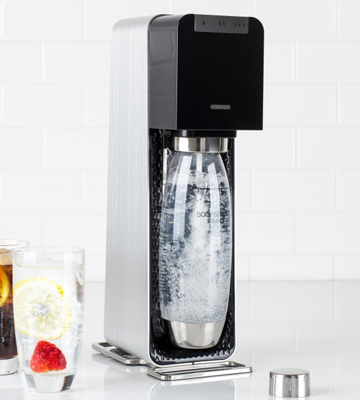 Get yourself a soda maker and enjoy the unique taste of fizzy drinks tailored to perfection in the atmosphere of your home. Having your own carbonated water machine at home, you’ll be 100% sure that you drink only high-quality and pure drink, containing nothing but all-natural additives (some fruit or syrup) and will be able to control the amount of sugar you consume. The SodaStream Power machine is one such great soda machine. 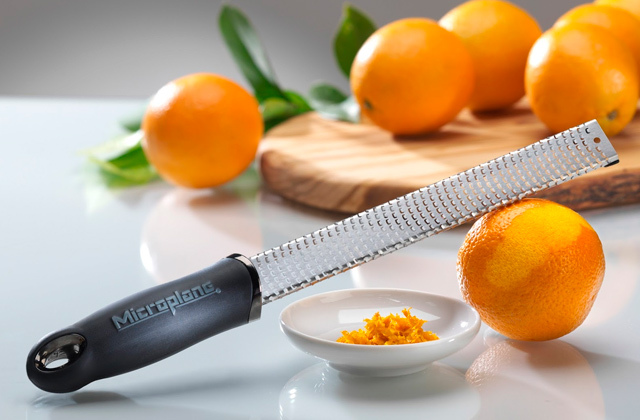 Compact, attractive and with many bells and whistles, it will take you no more than a few seconds to prepare your favourite carbonated drink. All you need to do is choose a carbonation degree, press On/Off button and the process will start. 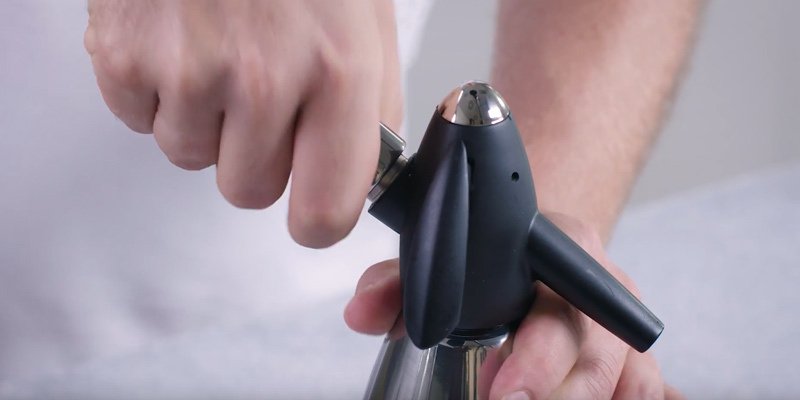 For leak-proof performance, the unit features a snap-lock mechanism that allows it to hold a carbonating bottle securely in place during the process of carbonation. 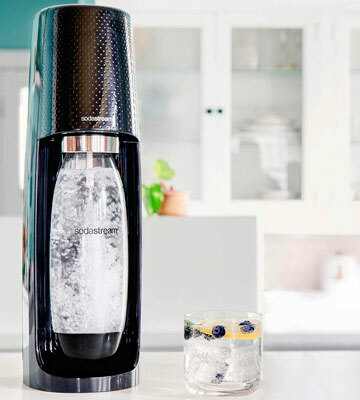 On top of great performance characteristics, the SodaStream Power boasts a stylish and sleek design. It has an elegant straight silhouette and comes in a solid metal housing with plastic black inserts. 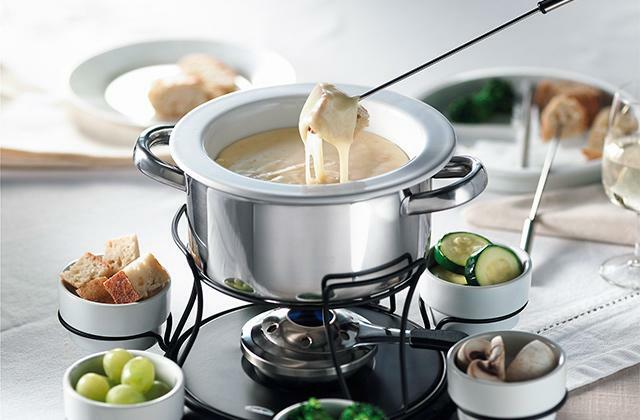 It will surely look great in your kitchen regardless of whether it has a modern or minimalistic-style interior. Packed with a 60L gas cylinder and 1L plastic bottles, this model comes ready for use right out of the box. Attach a power cord to the unit and plug it into a socket. Select the desired fizz degree and press the button on the front panel. Once the LED light indicator goes off, the carbonation process is over. It’s common knowledge that soda tastes best when it is cold. Hence you can add several ice cubes or some crushed ice to your glass. 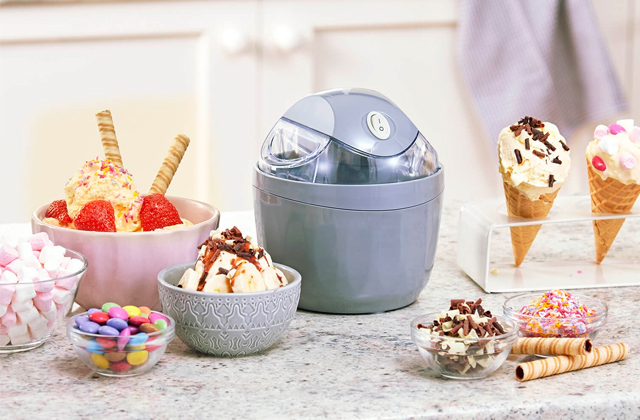 An ice maker will complete your kitchen arsenal, expanding your options drastically. You can drink plain seltzer water or you can flavour it by adding different fruits and syrups. This SodaStream machine offers a huge range of syrups to try - from classy flavours (cola, tonic, cream soda, root-beer, etc.) to some really unique energized blends. Keep in mind, adding syrups should be done on the last stage when the carbonation process is finished. 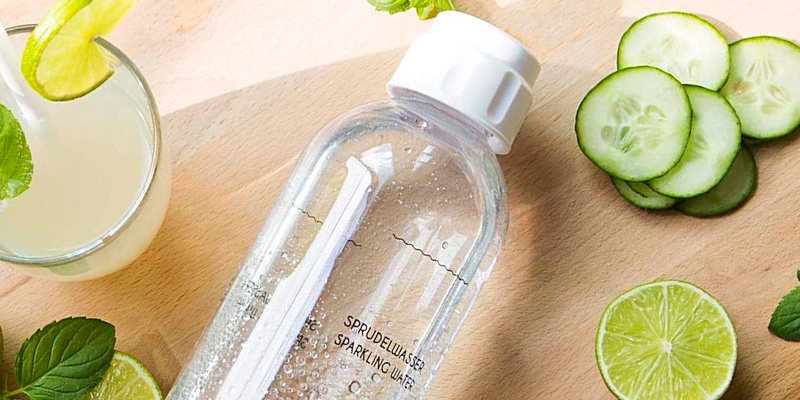 Since SodaStream is not new to soda makers market and is backed by decades of experience in water carbonators production, the manufacturer has already worked out its own successful concept of a really efficient sparkling water maker. However, life does not stay still. Times change and define new trends both in our lifestyle and in our daily needs. What was considered relevant and up-to-date several years ago, might look a kind of old-fashioned and outdated today. Yet, soda popularity doesn’t change. 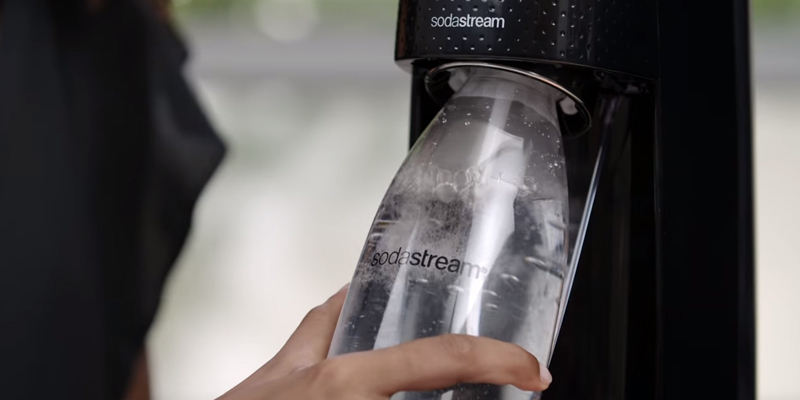 Hence, SodaStream makes constant updates in its machines to keep up with changing style trends and still meet the needs of all soda enthusiasts. 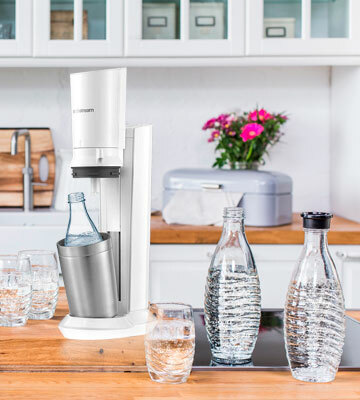 In the SodaStream Fizzi, which is one of the latest models in the company product range, the manufacturer packed all the basic features that have proved to be reliable and efficient in a renewed more sophisticated yet not less functional design to meet the needs of a modern kitchen. easy frizz adjustability to make your soda your way. All of this is what soda fans love about SodaStream and exactly what you will get with the Fizzi machine. The model comes with a Mini CO2 carbonator to make up to 9L of sparkling water and a 60L gas cylinder that will last for several weeks and can be exchanged for a full one just at the price of gas. Speaking of the unit design, it is minimalistic yet stylish and very modern. A sleek body in a black glossy finish and featuring capsule-shaped design looks somewhat futuristic and will perfectly blend with any hi-tech, modern, and loft interiors as well as add a contemporary touch to more traditional interior styles. When it comes to automated soda making machines drawbacks, quite often customers complain that appliances are pretty bulky and require extra space on the countertop. It might become a real issue for those who have concise kitchens or live in small city apartments limited in space. 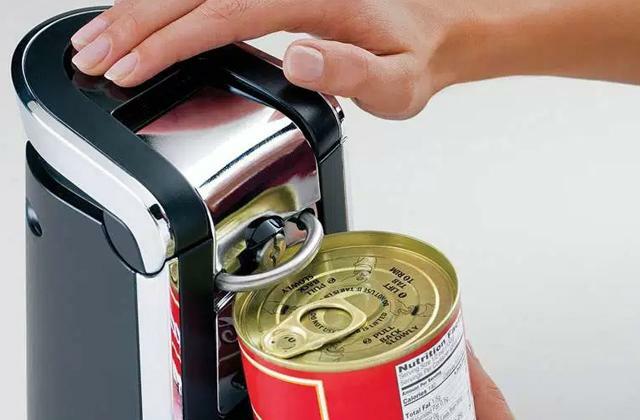 And even if you have a large kitchen with ample space on your countertop, you still might face some inconvenience since there might be many other kitchen appliances you’d like to place there, from an electric kettle to a coffee maker and toaster. Yet, with the Frizzi, you won’t have that problem. 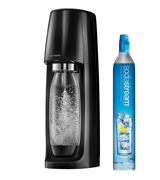 This model is one of the slimmest units in a SodaStream product range. Engineered in a company own lab, it was created with modern kitchen needs in mind and boasts a truly space-efficient design that will fit into any kitchen or bar. If you prefer classy designs, the Nuvantee Soda Syphon will be your best choice. 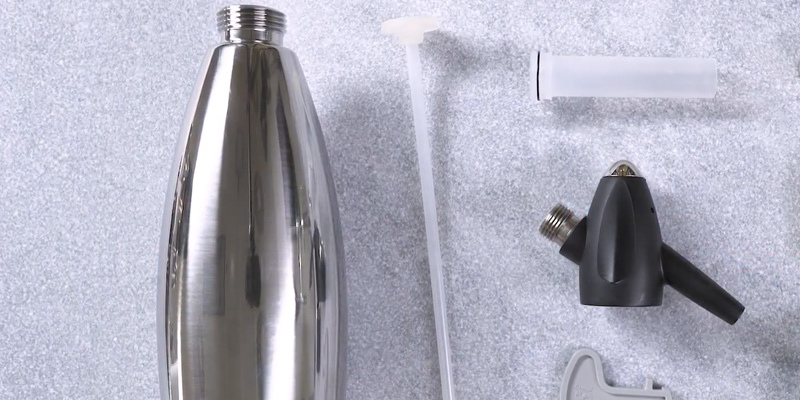 It looks like a traditional syphon with a dispensing nozzle but it has some nifty features to offer. Compared to old-fashioned models, the Nuvantee Soda Syphon uses disposable CO2 cartridges and it can both dispense and carbonate water. The device is very simple to use. It is enough to fill the container with fresh cool water, screw the cap on the neck of the bottle, put a cartridge in place, and press down the lever to fill a glass. Voila! Your drink is ready. Most soda maker appliances carbonate a litre of water. The issue with that is this water goes flat very quickly. With the syphon, though, it will remain sparkling until you empty the bottle. Another thing that will attract your attention is a housing composed of aluminium and a carbonating bottle made of glass. This will allow you to keep water cool much longer than if you stored it in a plastic container. Equipped with a built-in pressure regulator and a threaded lid the Nuvantee Soda Syphon is safe and convenient to use. It is compatible with all 8g CO2 disposable chargers which allow you to carbonate up to 1L of water. 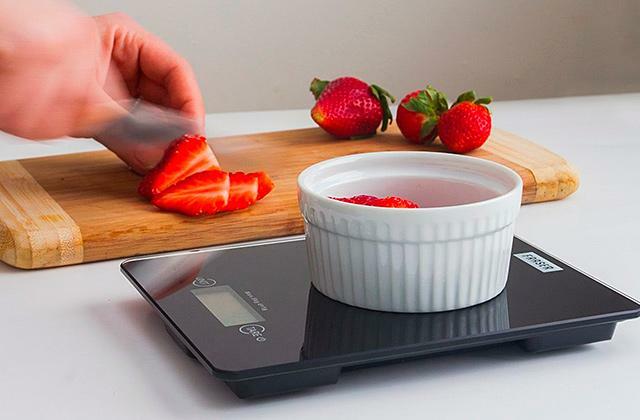 This model is very compact and won’t take a lot of space on your countertop or on a kitchen shelf. It is also a handy on-the-go solution for family picnics, trips, and journeys. 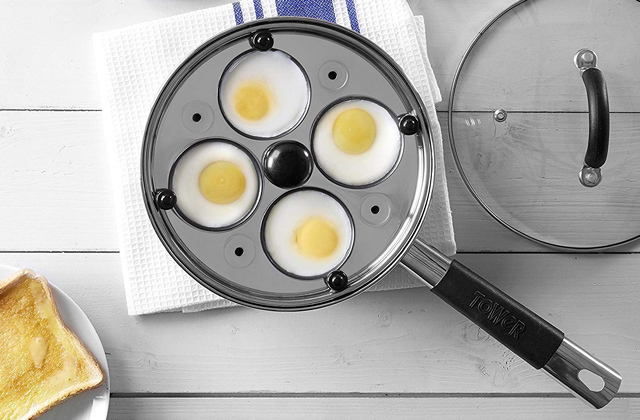 The syphon is dishwasher-safe and very easy to assemble and disassemble. A sparkling water is a basic ingredient for many cocktails. You can mix it with wine and sweet fruit to make refreshing Sangria, blend it with syrup and whiskey for a classic whiskey and soda highball, or combine it with squeezed lime, crushed ice, and chopped mint for a refreshing Mojito. The options are endless! If you host a cocktail party or a reception on the roof, an ice bucket will help you keep your drinks pleasantly cool. Making soda in a syphon is a piece of cake! Get an 8g CO2 cartridge from a store and insert it into the syphon. Insert a measuring tube into the bottle to pour the right amount of pure cold water. Tightly screw on the dispensing cap. Insert a CO2 cartridge into a special holder and swiftly screw the holder in the cap. Shake the syphon several times or put it in the fridge for about 30 minutes to get a higher fizz level. Before disassembling the syphon, press down the lever to release the remaining gas. Then unscrew the syphon cap counter clockwise and only then remove the used cartridge. If you need to wash the bottle, remove the measuring tube using a durable plastic fork. When you disassemble all syphon parts, you can rinse them under running water or in a dishwasher machine. Avoid filling the syphon with anything other but water and always attach the cartridge tightly to prevent unwanted gas release. 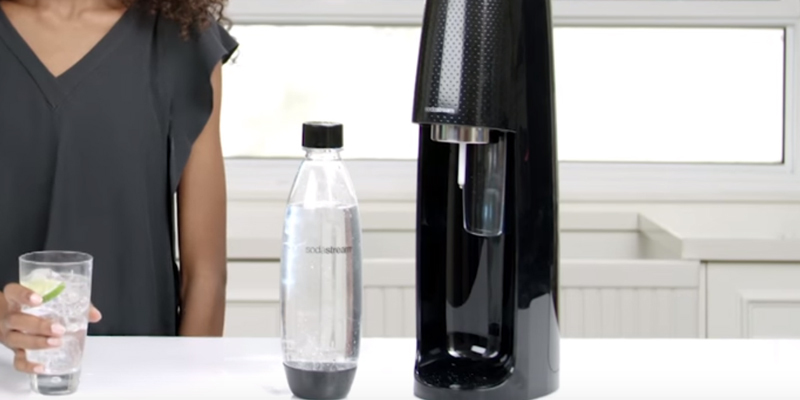 Compared to many other models, this SodaStream Crystal water maker looks very modern. It has a durable and wear-resistant stainless steel housing painted matte back, which makes it look particularly appealing. It uses neither batteries nor electricity. The carbonation process is purely manual and requires you only to install a carbonator and press a single button. 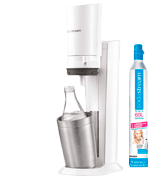 Also, the SodaStream Crystal water maker offers users incredible ease of use, thanks to its snap-on design. You will not need to screw a bottle in place. It will be enough to push it a bit forward at an angle and it will snap on the machine effortlessly. To prevent leakage during the carbonation process, the machine has a special metal cup to hold the bottle in place. 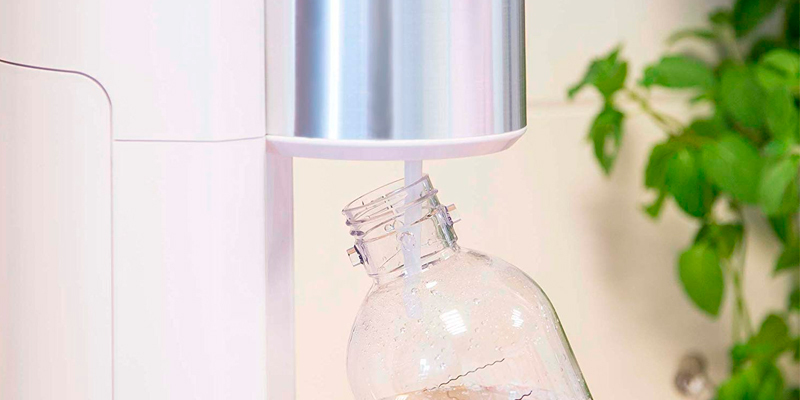 Buying this SodaStream Crystal water maker, you also get a glass carafe, which is a great advantage given that most machines come with plastic carbonating bottles. Naturally, glass serves longer and it doesn't allow potentially harmful chemicals to get into the water. Besides, glass is dishwasher safe, and this means ease of cleaning. It is recommended to store pressurized carbonator cylinders in a cool place to prevent gas pressure from increasing due to the excessive heat. Do not touch the cylinder if it's being left exposed to the sun for too long and wait until a pressure release valve forces all CO2 out. Only when the cylinder warms up to the room temperature is it possible to dispose of it. When choosing kitchen appliances, in addition to being reliable and functional we want them to be elegant and stylish so that they match our kitchen interiors. The same goes for a soda maker. Although it's not one of the essential appliances, when selecting one, your eye will naturally search for the most beautiful one. To save you time, we'd like to offer you to turn your eyes toward the Levivo water carbonator set which both looks great and performs well. The Levivo 331400000249 looks modern yet has no annoying frills. It features a streamlined body with rounded corners, packed in black stainless steel and plastic. Thanks to such design, this soda maker will be able to add a contemporary touch to any classic or country-style interior as well as perfectly blend with any modern, minimalistic, industrial, or fusion style. However, beautiful design isn't the only merit of the Levivo 331400000249; it has a lot to offer performance-wise too. 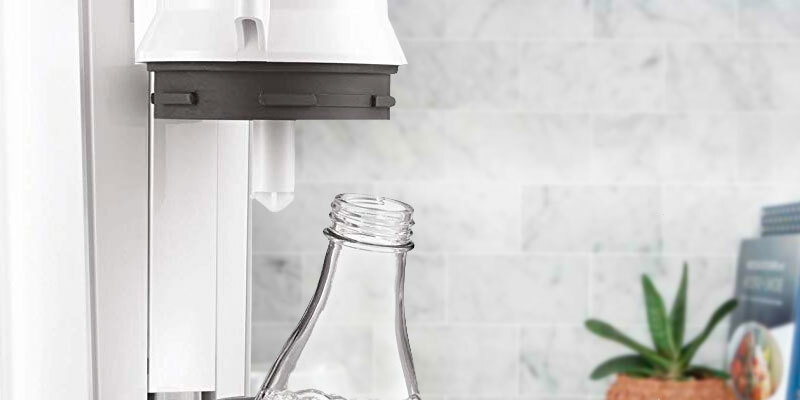 Like other home soda makers, the Levivo set includes an automatic carbonator, a 60L CO2 cylinder, which will let you prepare refreshing seltzer for at least a couple weeks on one refill, and 2 carbonating bottles where you will be able to store and serve your bubbly drinks. Sturdy construction is another advantage of this model. 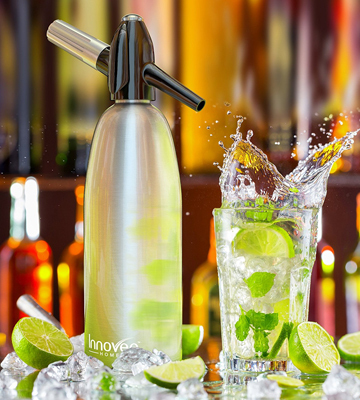 It has a well-thought-out design with a secure bayonet lock that greatly simplifies the installation of a carbonating bottle. And when the drink is ready, taking the bottle out is even easier by pushing one single button. A small drip tray that is affixed at the bottom of the construction collects and keeps all spills, ensuring mess-free operation. The Levivo 331400000249 includes two carbonator bottles, both made of top-quality PET, the kind of plastic that is known for being not only lightweight and durable like other food-grade plastic but also recyclable. Probably this isn't the most important feature about this soda maker but it will certainly please environmentally-conscious consumers who're looking for ways to reduce the amount of plastic waste. Also, PET looks very much like glass, giving the bottles that crystal transparency. But unlike glass, they do not break easily, meaning they will serve you for a long time. If you have a family of soda enthusiasts where adults like pure sparkling water and seltzer-based cocktails and kids adore lemonade, you know that carbonated water is never enough. Yet, with the Levivo carbonator, you will have an opportunity to keep a spare bottle of soda always at hand. The set contains two carbonating bottles, which means when one empties you'll have another one in reserve. Having two carbonator bottles also means you can keep one at home and use the other one on the go. Many people think that drinking carbonated water is harmful to health. Yet, it's a common myth. Soda has many benefits to health. Being acidic, carbonated water helps improve digestion. 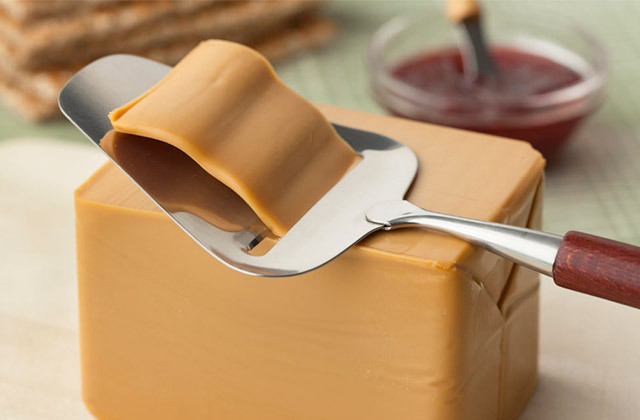 Plus, it helps enhance the feeling of fullness and prevents constipation. Unless you drink it with sugar and sweet syrups regularly, soda will do more good than bad for your health. You'll hardly find a person who would reject a glass of sparkling and cold soda or lemonade with a slice of lime. If you're one of these people who easily yields to this temptation, a soda maker is what you need to have in your kitchen. 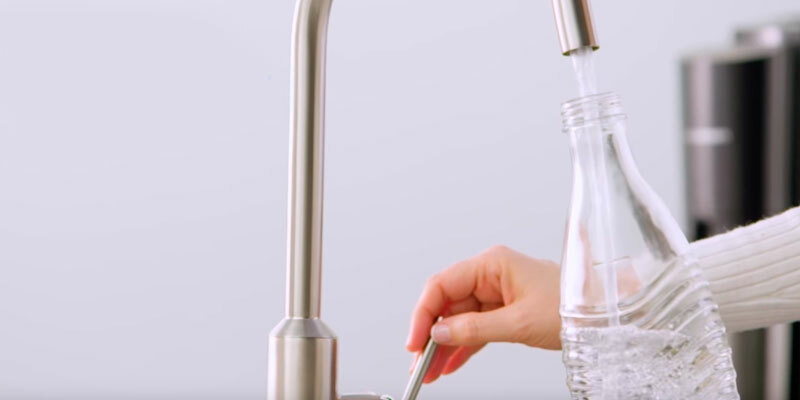 Initially designed as a siphon to dispense soda into cocktails, today, soda makers use CO2 cartridges to carbonate tap or bottled water. With that, the carbonation process itself has also become much simpler and less time-taking. Thus, if you and your kids adore carbonated drinks, don't hesitate to get yourself a soda maker and create your own bubbly beverages in the comfort of your home. On a long scale, acquiring a soda maker for home use, you can also save quite a lot of money that you'd pay buying cans of soda from a store. Soda isn't the only drink that you can prepare in a soda maker machine. It is also fit for carbonating tap water. The only thing we'd recommend you to do first is equip your kitchen sink with a water filter so that the water you use is clean of all harmful additives and impurities. A variety of soda makers for domestic use falls into two major categories: soda syphons and soda maker appliances or saturators. A soda syphon is usually a bottle with an inserted replaceable CO2 cartridge to infuse water with bubbles via a special valve. Commonly, syphons are easy to store and move around, and simple to use. Yet, they provide a lesser degree of control over carbonation level and are not meant to produce large amounts of seltzer water. So, syphons are perfect for casual soda drinkers. Soda saturators or stationary soda makers are actual appliances. Being rather simple, they offer an automated way of making soda. They use a carbonator cylinder filled with CO2 and installed on one side of the machine to deliver fizz water into the bottle attached on the other side. 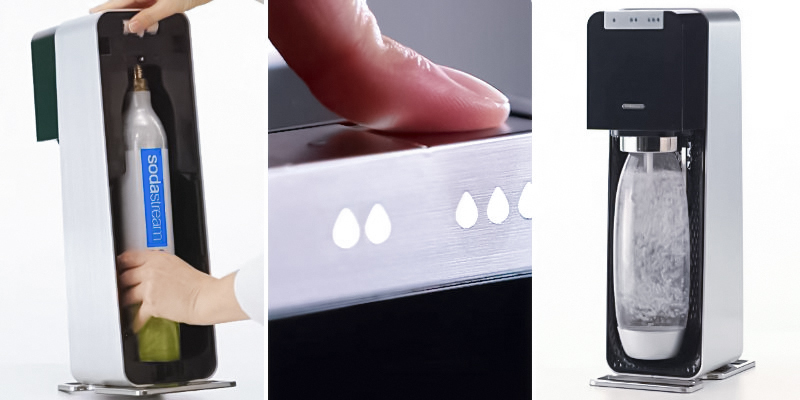 They produce soda easier and faster at a single touch of a button. 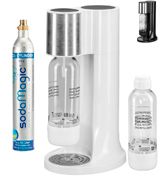 Soda water machines are a great option for those who need a source of carbonated water on a regular basis. In syphons, bottles are usually made of aluminium to be more lightweight yet durable. When it comes to soda making machines, the body is made either of plastic or metal or a combination of both. Though a metal design looks more solid, it is heavier and less portable. Water bottles or carafes are made of either plastic or glass and come with closures to store your drink in the fridge. In case of plastic bottles, always check for BPA-free plastic. Compact syphons use small disposable 8g CO2 cartridges. One cartridge goes for 1 litre of water that is exactly a syphon bottle capacity. This type of soda makers is compatible with any 8g cartridges available in the stores. Soda maker appliances boast times the higher capacity. 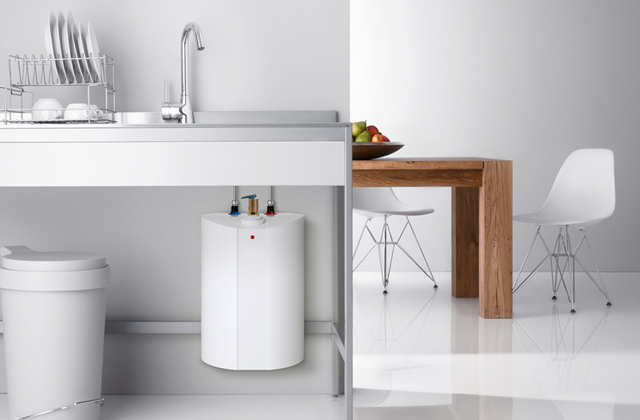 They are compatible with bigger CO2 cylinders designed for carbonating 60 or 130 litres of water. Besides, they have an adjustable carbonation option to optimize the gas consumption. Hence, you can forget about refilling the cylinders for up to 3 months. 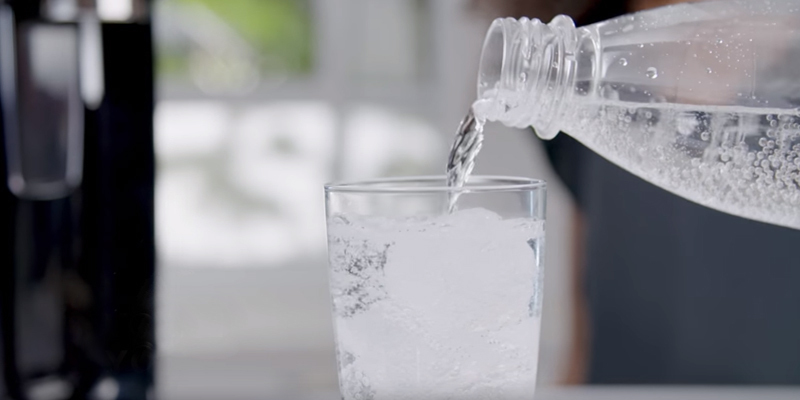 There are several features that contribute to soda makers ease of use and allow us to appreciate all the benefits of making sparkling water at home. For user convenience, both automated appliances and syphons offer simple intuitive control buttons and levers. All soda makers allow for carbonation level adjustment. More sophisticated machines are distinguished by preset fizz modes while others offer manual carbonation adjustment by pressing a carbonator button. Some models even come fitted with an LED indicator or a display showing how carbonated your drink is. Thus, you can make a mild sweet beverage for your kid or a cocktail with a stronger fizz for yourself. In addition, soda makers often are complete with a variety of syrups allowing you to experiment with flavours of your drinks. 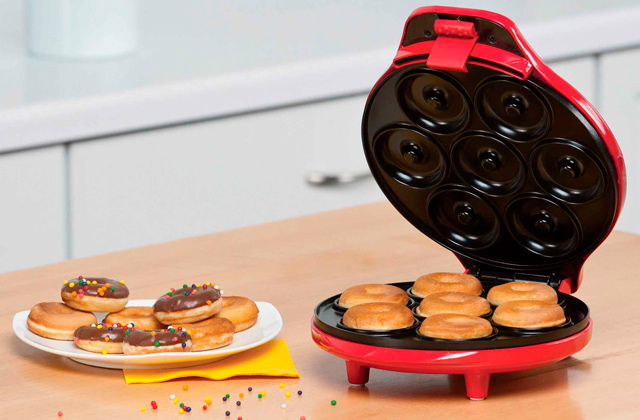 Packed with CO2 cartridges, bottles and a range of flavoured syrups, most appliances can be used right out of the box. Q: Why should I get a soda maker? freedom to experiment with flavours by adding different ingredients to your liking and creating new unexpected yet delicious combinations. Q: Do I need to treat water somehow to use it with a soda maker? A: Most models are designed to carbonate only water since any other liquid can cause damage to the carbonating system. Yet, you can come across soda makers that on top of carbonating your beverage can infuse it with fruit. Anyway, you can always customize your fizzy drink by adding some syrup, fruit or herbs into a carbonated water. Q: Does my home drink maker require some specific cleaning? A: Both automated soda makers and syphons are very easy to clean requiring no special procedures. To clean the appliance, it is enough to wipe it with a soft, damp cloth using non-abrasive cleansers. As far as carbonating bottles are concerned, most glass bottles are dishwasher safe, whereas plastic and aluminium bottles can be washed in warm water with a bottle brush and some dishwashing liquid. A: Soda maker carbonators are made in full compliance with all safety rules and specifications. Usually, they come equipped with a special valve to release the gas and prevent overpressure if the pressure within the cylinder rises too high. Yet, it’s an unlikely event. The major safety rule every user should stick to is to avoid exposing a cylinder to extreme heat. 1. Top 10 Soft Drinks, Caffeineinformer. March 27, 2015. 2. Anna Perling The Best Soda Maker, The SweetHome. June 8, 2016. 3. Jillee The Surprising Benefits of Home Soda Makers, OneGoodthing. March 1, 2016. 4. 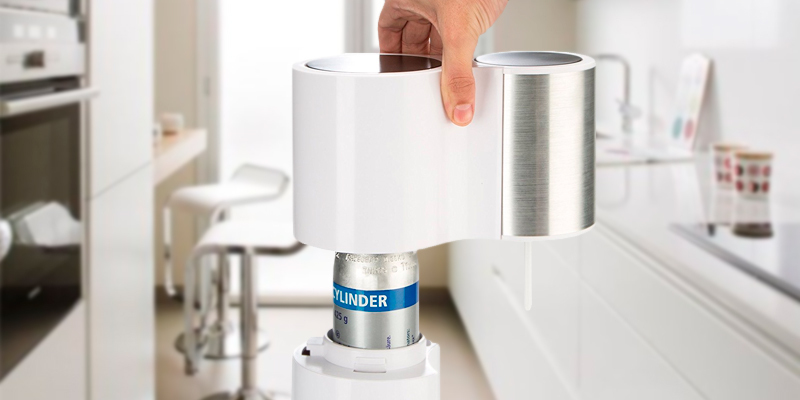 Soda Maker Review, ThoroughlyReviewed. 5. Soda syphon, Wikipedia. July 31, 2016. 6. Carbonated water, Wikipedia. July 29, 2016. 7. Top 5 Best Soda Maker Review For 2016, Groomandstyle. July 12, 2016. 8. 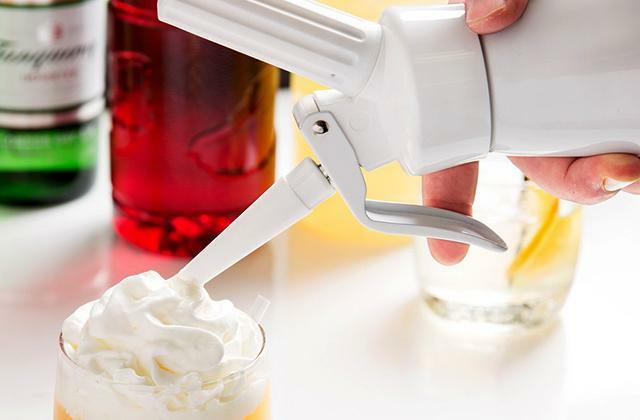 A Sleek Source of Do-It-Yourself Fizz, Chowhound.